Penganalisis politik Karim Raslan mengkritik pengerusi Suruhanjaya Pilihan Raya (SPR) Tan Sri Mohd Hashim Abdullah malam tadi semasa mengulas pilihan raya umum ke-14 di kaca televisyen. “What are you doing? You should just resign. If you can’t handle the heat, get out of there. You have done the most shameful thing, you have let us all down (and) the people of Malaysia,” katanya. “We’ve all been waiting for you to make these announcements and there are 47 seats to come. And what is going on in Sabah? We’ve been asking this. “How is that Sarawak, this enormous state, the head of the SPR, could have sorted it all out. That guy, who is the head of the SPR of Sarawak, should be running the country’s SPR. “This is despicable, absolutely appalling, and what I would like to know is that what are the pressures behind you? Who’s whispering in your ears? “This is the kind of ridiculous rubbish that we have to see the end of today. “Semuanya setuju ya? Rubbish! This kind of manipulation going behind the scenes. “Just tell it straight. We are a very mature, sensible people, we’ll just move on,” katanya. 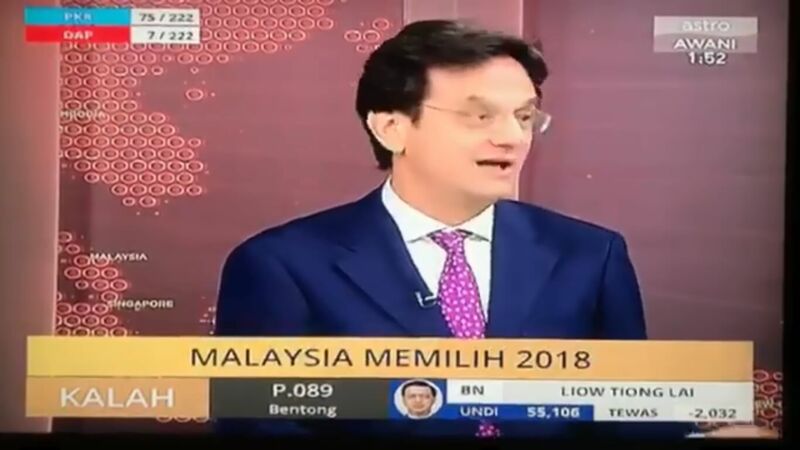 Karim, yang merupakan Ketua Pegawai Eksekutif (CEO) KRA Group, ialah salah seorang ahli panel jemputan di Astro Awani malam tadi.